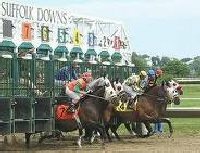 Massachusetts only has horse and harness racing, no casinos. All racetracks are open daily to offer simulcast wagering on national horse races. Call the Massachusetts office of tourism 800-227-MASS or visit the official state web site www.massvacation.com for additional travel information. For detailed information regarding casino promotions, hotels, slot machines, entertainment, spas, golf courses, casino RV Parks or gambling games available click on the casino name. Casinos near all major U.S. cities.